Rockchapel or Séipéal na Carraige, on the banks of the Feale is a small village in North Western Co. Cork about half way between Kanturk and Abbeyfeale and ten miles from Newmarket. Relatively high up for Ireland at c. 200 metres in altitude O.D., the uplands surrounding Rockchapel form the Mullaghareireck chain. Officially, the village is in Knockahorrea East (or Stagmount) which has several derivatives ‘as Gaeilge’, depending on the English version one chooses. Cnoc a’ Chartha – Hill of the Standing Stone, Cnoc a’ Chorrfhaidh – Hill of the Stag, Cnoc a’ Comhraidhe – O’ Curry’s Hill and Cnoc a Corrfhiadh ‘Hill of the Stag’ all are Irish versions of this townland. This area was only settled relatively recently, as infrastructure was built in the early 19th century to accommodate the Butter trade which was booming at the time in Munster through Cork butter exchange. The road, opened the area up and made settlement possible – prior to that there were only tracks which trains of donkeys could travel with goods loaded on their backs. The Feale has its source in the Mullaghareirk Mountains close to this village. The river, which is renowned for its’ fishing, particularly the white sea trout. The river Feale gets its’ name from a Milesian noble lady named Fiale who was wife of Lewy (son of Ith and uncle of Milesius King of Spain) while bathing in a pool in Rickhill known as ‘Poll a Tíre’, she saw a man approaching and in her efforts to conceal herself she slipped and was drowned. The man approaching was her husband whom she did not recognise in the distance. The river that claimed her life was named in her honour. Rockchapel is the birthplace of An Bhráthair Tomás O Rathallaigh who was Superior General of the Presentation Order from 1905 to 1925. He wrote two poetry books, ‘An Cuacáin Draíocht’ and ‘An Spodag’. David Walsh wrote a book of poetry entitled ‘Extending the Light‘ after being dismissed from his job as a Prison Officer on Spike Island for his Nationalist views. Denis Guiney, of Guiney – an Irish chain with stores around the country was from the Rockchapel area originally. More recently, Rockchapel has become associated with Sliabh Luachra traditions and culture and this is being kept alive and healthy by its’ vibrant cultural and heritage centre, Bruach na Carraige and the efforts of Chairperson Jack Roche, members of the committee, members of Ceoltoiri Sliabh Luachra and members of local and wider community as a whole. The traditions are celebrated through showcasing Sliabh Luachra song and dance to both the familiar and unacquainted, educating younger generations in Sliabh Luachra music, song and dance and overall ensuring guardianship of a unique microcosm of cultural traditions which exists in these north west Cork uplands. Taur is a sparsely populated upland rural area with a church, shop, school but few other services. The closest villages and towns to Taur are Newmarket, Rockchapel, Ballydesmond and Boherbue. The church stands at 250 metres above sea level, giving the village a reputation for being ‘high’ locally. Traditionally, agriculture has been been the traditional industry in Taur along with turf cutting in the summer. Nowadays, with the advent of rural depopulation and the decline of agriculture commercial forestry plantations are a more apparent feature of the landscape in Taur as with neighbouring Rockchapel and other areas of Sliabh Luachra. Taur (along with Meelin) was surveyed by the famous geologist Mr. G.V. du Noyer and his assistant Mr. Wilson. They paid particular interest to the limestone outcrops which occurred in the areas aforementioned . There are mentions of coal measures and chert in the vicinity. This hill was once the royal residence of Cú Rí Mac Darragh, King of West Muster. ‘Cú Rí Mac Daire was King of West Munster in A.D. 1, and Temair Eran on Cathair Conroi as his residence as Chief of the Ernans or Tuath Sen Eran. Catair Conroí, Dun Cearmna at Kinsale, and Dun Sovarki (or Sobhairce) in Antrim were the three old buildings of Erin’ . Knocknagree (or Cnoc na Grai, Hill of the Hare) is a village located on the western most extremities of county Cork bounded by the Blackwater river to the west which forms the border with Co. Kerry. Knocknagree National School was built in 1840 and the total cost of constructing the schoolhouse came to £234.4.11 (a grant of £160 was given from the government, while local people contributed the remainder) (Mulooly, P. & ors., 1985. 47). Traditionally, like much of Sliabh Luachra a poor area big estates and estate houses were few and far between – Knocknagree House however is a big house in the area which is still extant (O’ Duinnin, P. 1989. pp. 66-67). In times past, Knocknagree and its Fairfield was the site of one of the biggest, if not the biggest livestock fair in Munster. The Fair was held on a monthly basis, with 15 public houses serving the clientele of the day. Other local events included Latiaran in Cullen and its’ associated Feis along with attractions in Rathmore such as aeríocht, ploughing matches, the cinema and the rail station which pulled people outwards (Moynihan, D. 1983, p. 17). Though this tradition died out in the 1970s, its memory still holds strong in the folk memory, heritage and traditions of this small but lively village. Nohoval is said to have been a monastic settlement, founded by St. Finian Fionn in 566 AD. Church was within the present graveyard, now marked by trees planted 1770. St. Finian was the patron and founder of the monastic establishment of Innisfallen in Killarney which gave us the Annals of Innisfallen Both the church and tower were connected by underground passages. The monastery was constructed with limestone. Many stone forts (cashels) existed in a nearby field but all these are much disturbed for road building. Nonetheless, some settlements must have grown around the monastery, either monks or lay people. In 832 AD, a round tower was built for protection from the ‘Danes’ or Vikings as we term them today. (Roche, J. 2014). Shine Lawlors’ grave is on the altar site. There were trees planted in the site of the original church in 1770. Fifty yards north of the monastic chapel was a round tower constructed of cut limestone. An underground passageway, seen in 1820 is thought to have connected the Church with the round tower. The monks were dislodged from this monastery in 1645 with the arrival Cromwellian forces in Ireland who levelled the original edifice. The monks afterward built a small chapel in a field now owned by Hugh Twomey which is still known as ‘Páirc an tSéipéil’. The final fate of these monks is unknown. There was a mill and a granary at the site also, and the remains of several enclosures nearby. The remnants of these enclosures were used for the construction of the road to Knocknagree (O’ Duinnin, P. 1996, p. 100). Most people today in the area know that Nohovaldaly is a burial ground, but the vintage of it may not be realised by many. Nohoval was also associated with our earliest Gaelic poets, the O Dálaighs, including Geoffrey Fionn O Dálaigh who died in 1387 and is a prized Irish bard. Rounds were performed at Nohoval graveyard, especially on Good Friday of each year. Shine Lawlor’s grave is reputed to be the altar of the old church and is supposed to be 1000 years old. There are several priests buried at this cemetery, for example Fr. John Sheehan, and rounds were made around their graves in times past. There is a question whether famous Eoghan Rua O’ Suilleabhain is buried in Nohoval Daly or Muckross Abbey in Killarney – this famous Sliabh Luachra poet was born in Meentogues, located quite close by to this graveyard. Nohovaldaly appears in the Annates for 1471 (Murphy, 2010. p. 2010). Until 1793, the parishes of Kilcummin and Nohoval were one comprising of 67 townlands (Lyne, 2000. p. 90). 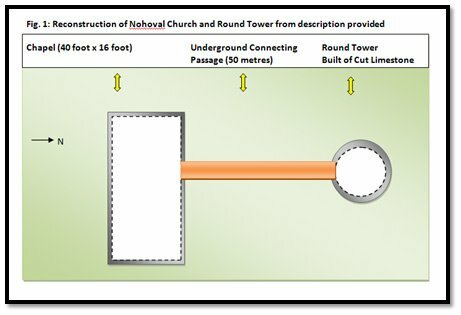 In the second half of the 17th century, there are records of a monastery and round tower at Nohovaldaly where a mass house was opened for local people (Fleming, E. 2012, p. 54). Nohovaldaly was ravaged by the famine, with the population decreasing some 88.5% in ten years, i.e. from 3954 in 1841 to a figure of 453 in 1851 (O’ Muineachain, D. 1996. p. 41). A more contemporary person of note from the Novohaldaly district was Paidin O’ Caoimh (1881-1973) who served as a Sinn Fein TD (1919-1922) in the first Dáil with eight other Cork TDs alongside Michael Collins and Seán Moylan, the latter being another Sliabh Luachra from Kiskeam (Breathnach, D. & Ni Mhurchu, M. 1993, p. 55). Rathmore, ‘An Ráth Mor’ or the Big Fort, is a unique town of two villages, a mile apart from one another. The ‘rath’ from which ‘Rathmore’ or Ráth Mhór, the large enclosure or in archaeological terms earthen ring fort, gets’ it’s name from is 1 km south of Rathmore village. It is circular and 96 metres in diameter. Within the enclosure are a souterrain, a ballaun stone and a possible children’s burial ground with two stone enclosures. Rathmore parish is a relatively recent amalgamation of the parishes of Nohovaldaly and Kilcummin East between 1785 and 1792. Rathmore is one of the largest parishes compromising of over one thousand five hundred households. The church in Rathmore was built in Gothic revival style though the architect is unknown. Big houses which were constructed in and around Rathmore included Mount Infant (built 1741; demolished 1970) and seat of the Duggan family. Shinnagh House and Coom Cottage (built 1790). Hollymount Bridge, or Droichid na Mine, was built in famine times. Cahirbarnagh, the Cistercians were thinking of establishing a monastery beneath Cahirbarnagh Mountain following their expulsion from revolutionary France. The local landlord, however (Cronin-Coltsman) refused permission to locate their monastery there so they relocated to Mount Mellery in Co. Waterford instead. The Church the schools at the west which known as Old Rathmore, and at the eastern section is the Railway Station which is known as New Rathmore. In 1875, the school was opened in Carrigaline, Rathmore. The parish church in Rathmore was built between 1850 – 1860. Rathmore has a long association with the dairy industry with the old Butter Road passing close by and the economy was boosted in the 1940’s by the coming of Cadburys chocolate crumb factory. The bridge at Duncannon (Dúin Ceann-Fhionn) was constructed by Richard Griffith while constructing the Old Kerry Road in 1834. This is located to the east of ‘new Rathmore’, at the Cork side. Also in new Rathmore is Shinnagh Cross, where one road takes you to Holymount and the other to Millstreet. On the 23rd of August 1824, Shinnagh Cross which the site of one of the last public hangings in Ireland. Timothy Cotter of Meenygorman, Newmarket was hanged for his role as leader of the Rockite Whiteboy Organisation which was founded in the 1820s to combat the brutality of soldiers towards peasants, mass starvation in 19th century Ireland and excessive rents charged by landlords. The last public hanging took place at Shinnagh Cross, retribution for the murder of William Brearton (six White Boys were hanged). Rathmore has produced many famous sportsmen such as John Saunders (hurling – 1967 – 1972), Declan O’ Keeffe (football -1996 – 2003), DJ Crowley (football 1967 – 1971), Gerard Murphy (1995 – 1999), Tom O’ Sullivan (football – 2000-2011), Aidan O’ Mahony (football – 2000-2014) and most recently Paul Murphy (football – 2014) and like neighbouring Knocknagree there is nowhere like it on a Kerry versus Cork match day! Shrone, or ‘An Cathair Chraobh Dearg’ known locally as the city is at the base of the almost identical twin mountain peaks of ‘Da Chichi Danna’ (The Pap Mountains) or the Breasts of Danu. Danu was the Goddess of An Tuatha de Danann who are reputed to be the first people to come to Ireland. A shrine was erected to Ana at their base where sacrifices of animals and probably humans were offered. This is the oldest centre of worship in the Western World. Our most ancient harp legend tells us that Dagda, the warrior chief of ‘An Tuaithe de Dánann owned the first Gaelic harp’. At the battle of Maighe, Tuireadh fought between ‘An Tuaithe de Dánann’ and the piratical Formorians. The retreating Fomorians took away Dagda’s harpist Uaitne and his harp. In a daring raid, Dagda and his son Aengus Óg entered the Fomorian fortress and on recovering his harp he played the most ancient strain of the music in Ireland. Firstly he played the Goltraí or strain of weeping until all present began to weep, he then played the Geantraí, or strain of merriment until all burst out in fun and laughter. He then played the Suantraí, until all present fell into a deep sleep, and Dagda recovered his Harper. Danu is a pan-European deity, celebrated in ancient times by people across the continent and today are linked to names such as the River Danube in Europe and the Welsh goddess Dôn. According to folklore, Danu was mother to the Celtic Irish Gods and the daughter of the Dagda. Danu’s principle’s associations were with the agricultural year and she was highly revered by pre-Christian communities locally for her powers over cattle and health. In generations past on May Day, great celebration were seen in An Cathair Cubh Dearg with religious ceremonies, a pattern and a meeting of the chiefs of the Kingdom all taking place. Today, just a mass remains which is celebrating at Shrone each May. During the month of May (or Bealtaine), a sacred month in the pagan Celtic calendar year, local people Christianised the pre-Christian traditions and pay homage at the city, or Cathair Cubh Dearg on May 1st. Mass is celebrated and people ‘pay’ the rounds. The manner in which this is carried out is more complex than most at this ritual site. The rounds commence at the gap where a Hail Mary and Glory are said seven times while kneeling. Proceed around the site three times on the outside, keeping to the right hand inside, saying a rosary on each round, finishing each time at the Gap. At the western Station near the house, an Our Father, Hail Mary and Glory must be said five times while kneeling. Go around the site three times on the inside, clockwise saying a rosary each time, always finishing at the gap. Return to the western station and repeat the action previously done here. Make three crosses on the western station and state your intention. Repeat the Our Father, Hail Mary and Glory five times while kneeling at the Northern station. Go around the central Gallán, clockwise saying the rosary. Repeat the making of the cross 3 times at the Northern Station. Proceed to the Altar and say an Our Father, Hail Mary and Glory seven times. Repeat the making of a cross three times and pray to our Lady for your intentions. Finish with saying an Our Father, Hail Mary and Glory three times and have a drink of the holy water. Gníomh is an old land measurement which equates to ‘a ploughland’ (Moore, Fr. P. 1996, p. 47). Gneeveguilla, from prehistoric times was the seat of a historic centre – who we are not certain but their importance may be seen from the triple-ringed barrow and internal mound with standing stone at ‘Gullane’ townland, circa one mile southwest of Gneeveguilla village. This is a very rare example of this monument. Local lore suggests that ‘a giant in a tantrum took a huge bite out of Crohane Mountain, Glenflesk. He then spat it out and embedded it in Gullane’ (Fleming, 2000. p. 70). The church was designed by Mr. Robinson in the Italian Romanesque style, set into the backdrop of Tokenfire Mountain and with fine views of The Paps and Caherbarnagh Mountains. There is a seating capacity for 800 people. The seats are made of Colombian Pine, while the backed seats and altar rails were reused from the old church. The church opened at 11 o’ clock on 10th October 1937 (Fleming, E. 2012, p. 54). O’ Callaghans’ had a síbín less than a mile from the church in Gneeveguilla (Moynihan, 2012. p. 106). Gneeveguilla is renowned for it’s great Sliabh Luachra musicians, amongst them the Weaver Murphy family particular Denis and his sister Julia Clifford from Lisheen. They achieved national and international recogision for their unique Sliabh Luachra music as did the Paddy and Johnny Cronin of Reaboy, the Doyle’s of Jib and Johnny O’ Leary who became a legend in his own lifetime. There are a but few of the great musicians of this area. There is a monument in the village to the memory of all the musicians and poetry from the area as well as a monument to the great Sliabh Luachra seachai Eamon Kelly. Bounard or Beann Ard ‘the high peak’, is a townland south west of the village of Gneeveguilla where the Ryan family, formerly of this townland and mentioned in the roll of Meentogues school in 1871 (Honora, Patrick, Timothy, James and Jeremiah) are all mentioned. It is unknown when people first began extracting limestone from the quarry at Old Quarry Cross near Gneeveguilla, previously known as Carridulkeen Quarry. Lord Kenmare held ownership of this quarry, and a large lime kiln was in situe to burn lime. There are records which extend to 1740. (O’ Mahony, 1985. 21-22). Gneeveguilla is 750ft above sea level, a historic and tragic event occurred here on December 28th 1896 when after prolonged rainfall, a bog slip occurred and swept an entire family to their deaths’ (except one member, Katie Donnelly who was at her grandmothers’) and caused much disruption, damage and distress in the locality (Hickey, D. 1996, pp. 60-78). While electricity became available in Killarney in 1886 (O’ Duinnin, 1998. p. 99) however electricity arrived in Gneeveguilla only in 1954 (O’ Caoimh, 1991. 58) under the Rural Electrification Scheme. Kingwilliamstown is a unique village in Duhallow as it was built according to a specific plan and at a set time. Following disturbances in the Sliabh Luachra area in the early 1820s, the British government became concerned about an area of 1000 square miles of uplands without any roads or means of accessing it, and which they said was a haven for outlaws, rebels and rapperees. The area was surveyed by James Weale and Richard Griffith who produced the Report on ‘The Crown Lands of County Cork’. First a building of ample size to accommodate the workers was built and so designed to be turned into a hotel when the work on the village was complete. The building did serve as a hotel later and is now the Nora Herlihy Memorial Centre housing the Credit Union, which Nora founded a school and shops were built as well as houses for a carpenter, a smith, a shoemaker, and a tailor. There were five hundred and fifty men employed in building the village. A model farm was also built near the village complete with house out offices lands fenced ‘drained, and fertilized with lime to prove that good grass and crops could be grown on peaty soil by the use of lime. All the work was overseen by Richard Griffith who became well known in Ireland through his Griffiths valuation. In 1938 the name of the village was changed to Ballydesmond in recognising the association of the Earl of Desmond with the area. Barna bog (Co. Kerry) is located to the west of Ballydesmond, Co. Cork, and to the West and North West of Turreencahill, Co. Kerry. 499 acres of this bog were purchased by Bord na Mona in 1950 and peat extraction began there commercially. Now, as commercial peat cutting at this bog has stopped, all that remains are the rusted rails as reminders of the once thriving industry of turf cutting which existed here. There is a forestry plantation here now. The bogs are a haven for flora and fauna with many species of upland heath plants and birds such as the short eared owl calling Barna Bog home. The area commands impressive views of the Boggeragh mountains to the southeast, the Derrynasaggart mountains to the south and south west and the Macgillycuddy Reeks to the west and south west. The highest points in each range are Musheramore (647m), The Paps of Anu (697m) and Carrauntouhil (1041m). Local people still extract turf in this bog as traditional in the area. Glountane or Gleanntán (little valley), is located on the road between Ballydesmond and Cordal. Glountane , or Glantane another spelling, is said to be in the Castleisland region. Pádraig O’ Keeffe was born here in 1887, son of a national school Principal – he was the eldest of a large family. His mother was Margaret O’ Callaghan from Kiskeam, further south in Duhallow. He began working as a school teacher in the school here at the cross, a free spirit who found life as a teacher much too confined so he gave up teaching for life as a travelling music teacher. 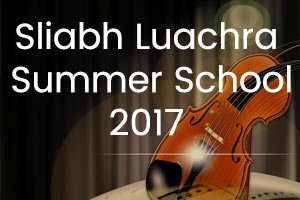 While this may have not been the best career path for himself to choose, it certainly was good long-term for Sliabh Luachra as he taught music to a group of the greatest Sliabh Luachra musicians. 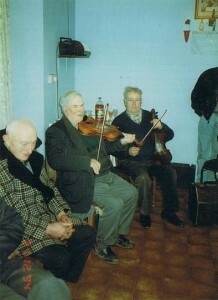 These musicians, along with Pádraig put Sliabh Luachra on the map as a region with an enviable position in the southwest of the county as it had its own unique identity. His most famous students included Denis Murphy, Julia Clifford and Johnny O’ Leary. 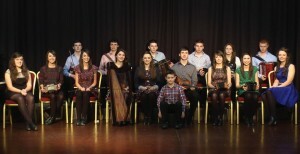 Over the years, the Sliabh Luachra style of playing music has become the leading regional style of music in Ireland with a large following on local, national and international forums. There is an annual weeklong festival held in Castleisland called the ‘Pádraig O’ Keeffe Festival’ and never fails to disappoint drawing large crowds to partake and appreciate near and far . Padraig O’ Keeffe passed away in the severe winter of 1963, no doubt the cold weather did not help his health and age. ‘Gleann na Muclach’, or glen of the pig-sties / where pigs are fed, is Glenamuckla ‘as Gaeilge’. This may indicate that there were farmers who kept pigs here in past times and the place was named after them. There are no historic monuments to note in Glenamuckla, though there are prehistoric monuments in Glenamuckla East, i.e. a fort, a fulacht fiadh and a dallan. Glenamucka is 2163 acres 3 roods and 43 perches. This is an upland area of hills, glens and cliffs with streams with fast flowing streams in between. This is reflected in the placenames of the area such as ‘Pleasure Hill’, ‘Faill Ard’ or High Cliff, ‘An Ghleann’ or the glen, and ‘Poll Uí Niall’ – O’ Neill’s Hole – a person so-named was drowned here. Glenamuckla however, is infamous for a gruesome murder committed on July 28th 1888 following a bitter dispute over land and money. A farm labourer, named James Rourke was shot dead while working in the hay field of David McAuliffe. A disguised man, armed with a shotgun approached the two men and asked them both to identify themselves. David McAuliffe identified himself truly, though James Rourke gave a false name – John Fleming. The armed man in this case discharged and shot James Rourke dead. James Rourke of Foilogohig West (Foyle) left a wife and ten year old daughter behind. The assailant on the day was standing barefoot, and to this day no grass has grown in the spot where he stood that fateful day. This supernatural occurrence has stumped University scientists and academics alike. It has always been maintained by the old people, that it is bad luck to stand in the footprints. The landowner today has erected a fence in order to prohibit the public from accessing them. On cold snowy days, they area of the footprints remains uncovered. Dogs sense evil and get disturbed and don’t approach the area where the footprints are located. Priests sense evil here. The footprints did not appear until 1920 – i.e. 32 years until after the murder was committed. 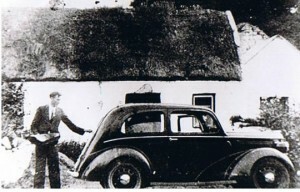 The farm originally had been held by John McAuliffe who appears in Griffiths’ Valuations circa 1852 renting an 85 acre farm from Letitia Purcell. The lands have changed hands several times, and the grass has been rooted by pigs, damaged by a bull and dug out by a farmer – but still the footprints have again reappeared. On the occasion of the farmer, he was sick for six months after he dug the footprints out and only improved once they were fully returned. Fr. O’ Donoghue, the local priest at the time predicted that they would last one hundred years. Hence, the tale of ‘The Footprints of Glenamuckla’ has come to be told. Knockaclarig is a small Duhallow community situated in the Mullaghareireck uplands of North West Cork near the borders with counties Kerry and Limerick. Knockaclarig, or ‘Cnoc a Cláraigh’ or ‘Cnoca Cláraig’ may mean Clare’s Hill or alternatively Bare or Flat-Topped Hill. There are three subdivisions of this townland, ‘Corr a Shosaidh’ – Round hill of the Encampment, c. 200 acres; ‘Bun a Cnuic’ – Foot of the Hill c. 180 acres; and ‘Barna na Gaoithe’ Gap of the Wind – applied to a hill. There are many monuments of both pre-historic and historic significance in the Knockaclarig area. Prehistoric monuments include a stone alignment, tumuli (now levelled) and fulachta fiadh while historic monuments include a church site and burial ground, a field hospital which used to accommodate six people, called ‘An Sean Oisbedeal’ and two Tuck Mills, one with its own Mill Stream. ‘The Tuck Mill was used in the woollen industry to improve the quality of the woven fabric by repeatedly combing it, producing a warm worsted fabric’. The fact that Knockaclarig had two Tuck Mills must have meant sheep rearing and wool production were vital components of the local economy at the time of production. Knockaclarig remained very much a strong native Irish area, and this may be seen through field names such as Pairc an Fhionn Fhuair (Field of the Cool Breeze) and Cnoc an Fhola (Hill of the Covert). Other descriptive names ‘as Gaeilge’ in the district describe holes in local rivers, such as Poll a Thailliúra – Hole of the Tailor (River Feale), or Poll na Feithe – Hole of the Bog Swamp (River Breanach). A supernatural feeling is emaulated through the placenames of Na Sídheoga (The Fairy Fortifications) and Carraig na gCat – ‘the Rock of the Wild Cats – applied to part of a hill said to be “haunted”. The headwaters of two of Cork and Kerry’s great rivers, the Munster Blackwater and the Feale, rise in the hills surrounding Knockaclarig. The River Feale flows to the north of the hill – ‘An Fhial’ gets its name from the daughter in-law of Milesius, who according to local lore died in fear and shame when she saw her husband, Lewy, in the distance and thought it was another man who saw her bathing in the river. Knockaclarig itself, is a townland sited geographically on a hill and surrounded by the townlands of Knockatooan, Knockawinna, Cloghvoula, Cappaphaudeen, Tooreenfineen, Glennakeel North, and Glenakarney which make up the greater Knockaclarig area.